Top speed is OK … if you’re a racecar. If you’re an electric car, the speed that’s more important is charging time. In this regard, the new 2012 Ford Focus Electric has some bragging rights. Among the many technologies incorporated in this EV is a fast on-board charger. “The best in the industry,” says Steve Ross, whose official title is Product Marketing Manager, Sustainability and Electrification, Ford of Canada. 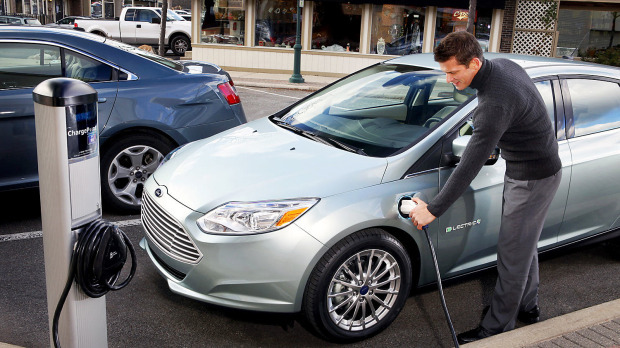 Ford claims the 6.6 kW charger on the Ford Focus Electric takes only three to four hours to charge a fully depleted battery when hooked up to a 240V, 32-amp charging station. By way of comparison, the Nissan LEAF has a 3.3 kW charger and takes about six to eight hours to achieve a full charge from a 240V source. According to Ross, this faster charging rate is a strategic element of Ford’s electric vehicles, and one that will ultimately give owners of its EV less to worry about when it comes to range anxiety, as when they are able to charge during the day, either at home or at a station along their route, they will be able to get more juice in a shorter amount of time, to significantly extend the kilometres they have at their disposal on any given day. The Ford Focus Electric’s range on a full charge is 160 km.